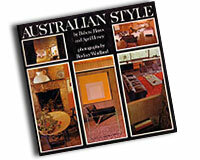 The first book of its kind to be published in Australia, Australian Style examines what was happening in Australian interior design and furniture in the 1970s with 236 pages of magnificent colour and black & white illustrations and input from then architects, designers and interior designers. 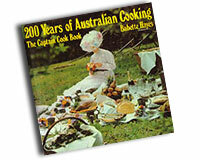 The recipes in 200 Years of Australian Cooking: The Captain Cook Book are part of Australian history and the parallel development of the colony and its cuisine is outlined in the text. This is a guidebook to our culinary heritage with stunning photography by Ben Eriksson carefully styled by Babette. The influences of the fairly constant influx of migrants up to 1970 from Italy, Greece, Russia, China, France, Germany, Holland and Sweden can bee seen. This book aims to bring the country to the city by introducing the hearty cuisine of the country. 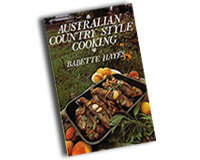 Drawing on the wealth of wonderful food available in the countryside and the creative talents of its remarkable cooks this 144 page book offers you an amazing array of recipes. Illustrated with colour photographs by Babette Hayes and black & white drawings/artworks from the Mitchell Library and Dixon Library collections. 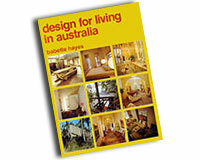 Design for Living in Australia brings together a survey of where design was in Australia in 1978 with reference to the values, fashions, trends and possibilities that were determining the style and a survey of the people who were making it happen. 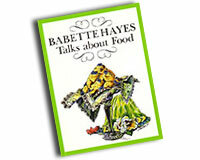 Babette Hayes Talks About Food takes you on a wonderful visit of food, family and friends. Recipes woven in with delightful tales and original illustrations by Francis Yin as inspired by Babette's feasts and home. The book is one of a series with Leo Schofield, Sam Orr, Charles and Barbara Blackman.